It is the 31st century. Mankind has spread to the stars and spawned titanic stellar empires, each controlling hundreds of worlds across a thousand light years and beyond. Yet the sins of man have followed him from the cradle of humanity. Political machinations of feudal lords plunge whole sectors into war; unscrupulous merchant starship captains smuggle weapons to their own faction’s enemies; greedy military commanders demand tribute from worlds they’re protecting; animalistic pirate kings harvest high technologies and human slaves in lightning raids; betrayals from oath-bound allies leave honorable soldiers growing cold on forgotten worlds; death at the tip of knife from a concubine turned assassin to avenge a world and love lost: it is a time of war. What empire will you swear allegiance to: a warrior merchant of House Steiner; the honorbound samurai of House Kurita; the vat-bred warriors of the Clans; a mercenary that fights only for the highest bidder? Choose your life in the universe: a MechWarrior piloting the thirty-foot-tall BattleMechs that turn the tide of any battle; a spy deep behind enemy lines discovering critical secrets; a merchant carrying critical supplies; a scientist unleashing the latest cutting edge technologies? How will YOU become a legend? Just bought this, I found there's no rules for mech combat inside. While I understand that this is a spin off from the wargame, I would like to insert some mech action into my rpg game from time to time without having miniatures. So what else do I need to buy to get a couple of mechs and being able to work them with some not too complex rules? You would want the Battletech: Total Warfare book. That contains all the basic rules for moving not just mechs, but also a wide variety of other vehicles around and blowing stuff up. Tactical Operations steps it up a notch even further which would probably be outside your wanted scope. Thanks, though that book seems to be quite big, and looking through the index, there doesn't seem to be any mechs described there. I read in other places that these are in Technical Readout's... so maybe I should take a look at those? And use them with tactical combat as described in A Time of War, would that work? What about the BattleMech Manual? 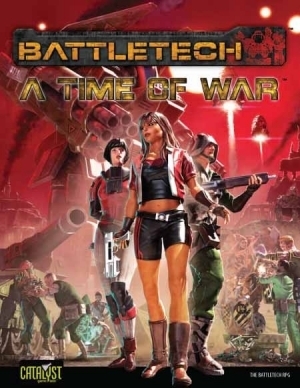 And is "BattleTech: A Time of War Companion" something I should consider? -thank you for the assistance. What are the differences with BattleTech: Classic BattleTech RPG I have already bought last year ? I am wondering the something. This title was added to our catalog on September 25, 2009.